Global pharmaceutical company, Actavis, is to become an official partner of the Men’s and Women’s EHF EURO 2014 in a deal with the EHF's media and marketing partner for the EHF EURO events, Infront Sports & Media. Actavis, based in Dublin, Ireland, is a global company focused on developing, manufacturing, and distributing pharmaceutical products into more than 60 countries. The commitment to the EHF EURO events extends the brand’s sponsorship activities across international sport. As an official partner of the EHF EURO, Actavis stands to benefit from extensive media exposure through prime advertising space on state-of-the-art courtside LED boards as well as static board and floor advertising. The company also receives multiple promotional and activation rights as well as a full hospitality contingent. Actavis is currently a premium partner of ice hockey’s European Trophy and the IIHF Ice Hockey World Championship. In addition, Actavis was present as a gold partner at the recent 2013 Barclays ATP World Tour Finals. 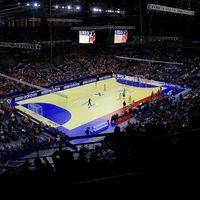 Jean Brihault, EHF President, said: “We are expecting huge worldwide interest in the upcoming Men’s and Women’s EHF EURO 2014 events both live in the arenas and worldwide via extensive television coverage. "This offers a global company such as Actavis an excellent opportunity both for brand exposure and sponsorship activation, and we are extremely pleased that they have chosen to partner handball and the EHF EURO events." Stephan Herth, Executive Director Summer Sports of Infront Sports & Media, said: “We very much welcome Actavis as an integral part of the EHF EUROs. Through this strong commitment as partner to both the men’s and women’s events, the brand will receive consistent exposure over the full term of the handball year. Actavis plc (NYSE: ACT) is a global, integrated specialty pharmaceutical company focused on developing, manufacturing, and distributing generic, brand, and biosimilar products. Actavis has global headquarters in Dublin, Ireland, and administrative headquarters in Parsippany, New Jersey, USA. Operating as Actavis Pharma, Actavis markets generic, branded generic, legacy-brand, and over-the-counter (OTC) products in more than 60 countries. Actavis Specialty Brands is Actavis’ global branded specialty pharmaceutical business focused principally in the women’s health, urology, gastroenterology, and dermatology therapeutic categories. Actavis Specialty Brands also has a portfolio of five biosimilar products under development in the areas of women’s health and oncology. Actavis Global Operations has more than 30 manufacturing and distribution facilities around the world.